Mariah on What Makes a Person Great? Drew on What Makes a Person Great? Friar Lawrence before he marries Romeo and Juliet he tells them a poem that could be summed up to love moderately. He begins with “These violent delights have violent ends,” and while this could be foreshadowing how the play ends. It could also means that while they love each other now from surface level they could learn more about each other that can change their relationship. He’s pretty much saying that they shouldn’t love in excess but instead love over time. I doubt that Romeo and Juliet will actually take this advise considering that they met two days ago and they’re already getting married. 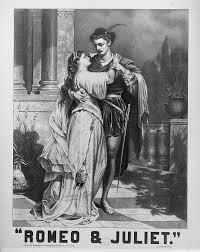 Romeo in my opinion is the least reserved because the day before he met Juliet he was pouting because he couldn’t marry a nun.